A Stuart, Florida man is facing hate crime charges after allegedly attacking a clerk at the Family Dollar Store in Martin County, according to the Palm Beach Post. After attacking the clerk, the defendant gave his reason for the attack to law enforcement agents as for, “no other reason than they are (expletive) Arabs. I don’t like Arabs.” The defendant had allegedly made a purchase earlier in the day with which the clerk had assisted him, and the defendant allegedly screamed at the clerk for overcharging the state sales taxes on the purchase, yelling, “You guys are trying to rob me. I’ll take care of you later.” Hours later, upon the defendant’s return, he allegedly confronted the clerk, yelling at him, and then stabbed him in the arm with a knife. The defendant is being charged with aggravated battery with a deadly weapon. Florida law protects minorities against hate crimes with a law that reclassifies misdemeanors and felonies by one degree in severity. Specifically, Florida statute 775.085, which regards the reclassification of offenses in evidence of prejudice, states that a penalty for a felony or misdemeanor charge will be reclassified if the commission of the offense was carried out for prejudicial reasons of “race, color, ancestry, ethnicity, religion, sexual orientation, national origin, homeless status, mental or physical disability, or advanced age of the victim.” For instance, a second degree misdemeanor becomes a first degree misdemeanor, a first degree misdemeanor becomes a fourth degree felony, a fourth degree felony becomes a third degree felony, and so on all the way until a first degree felony is reclassified as a life felony. Most people are aware of the following terms, and what those terms mean: race, color, ancestry, ethnicity, religion, sexual orientation, and national origin. Homeless status, advanced age, and mental or physical disabilities, which are also protected classifications, are defined below. Certain offenses are carried out against the homeless population simply because they are homeless. This statute defines a victim’s homeless status as lacking a fixed, regular, or adequate nighttime residence; having a nighttime residence that is a public or private temporary living shelter or living accommodations; or having a public or private area that is not usually used for sleeping accommodations. 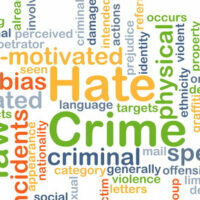 The elderly are classified as protected citizens under Florida’s hate crime law. A victim is of “advanced age” when he or she is 65 years old or older. Call the West Palm Beach criminal defense attorneys of the Skier Law Firm today at 561-820-1508 if you have been charged with a hate crime. We will assist you throughout each step of your case.